Decorating with nature is one of my favorite things..... it's incredibly inexpensive and it challenges me creatively. I've been collecting twigs from my back yard for quite some time and I finally came up with a fun and colorful project for them! Step 1: Cut twigs with pliers to desired length. They don't all have to be exactly the same length. I think it looks better if they are a little varied. Mine are around 13-14 inches long. Step 2: Paint twigs with acrylic craft paint and a foam brush. To create the ombre effect, choose two colors. Paint a few sticks with just one straight color, then mix in a little of the other color for the next twigs. Gradually add more of the second color. For the last few sticks, paint them with the unmixed second color. Let paint dry. Step 3: Cut a string about 5-6 feet long. Find the middle of the string and tie each side of it to the ends of the first twig. Step 4: Tie the other twigs to the string below the first. Just make a loop on each side, slide the ends of the twig in, and secure it with a knot. Pull tight. Step 5: When you have tied all the twigs together, make a double knot at the end to hold securely. Then snip off the extra string at the ends. Cool! I love the colors you used! You are a true artist when you can transform little twigs and turn them into a work of art. Beautiful. This is fabulous - rustic and modern at the same time! Creative creative fun fun great colour choice as well!!! I'm always collecting sticks! Finding new DIYs for them is exciting thank you! 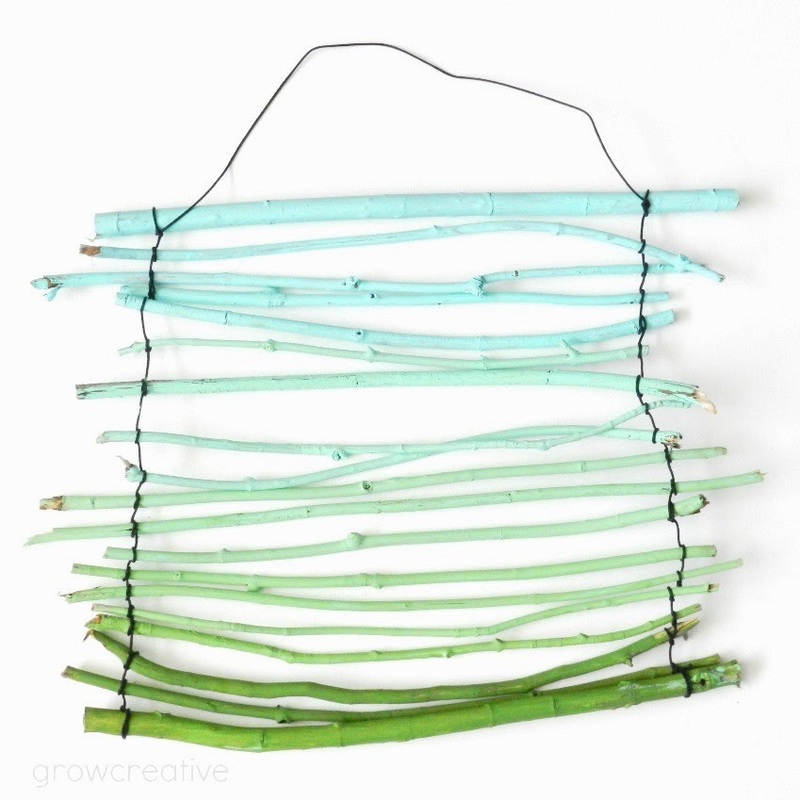 Really love the colors on your wall hanging with the sticks. They look great .What color wall do you hang it on? Would love to see how it looks in a room. I love making things with sticks, pine cones, whatever else I can find. I'm really big on pine cones this time of year and for the holidays. Pine cones and some spray paint will do it every time.